One of my fondest memories of summer was my family’s afternoon naps when I was still in the elementary school. We lived in a small apartment, and it was expensive to have the AC on all the time. My parents would lay down a straw mat on the floor in the living room for the three of us to nap on. The afternoon golden sun rays trickled into the room through gaps between the vertical shades, making wobbly light and shadowy patterns. The warm afternoon breeze traveled through the back balcony, past the kitchen, kissed our faces, and then made the shades clap against each other gently as it exited the front balcony. The picture in my head makes me want to take a nap right now. After the nap, my mom may start to prepare for dinner. It is hard for me to remember what we ate back then. But the dishes must have been cooling, for the summer heat in Taiwan was brutal. 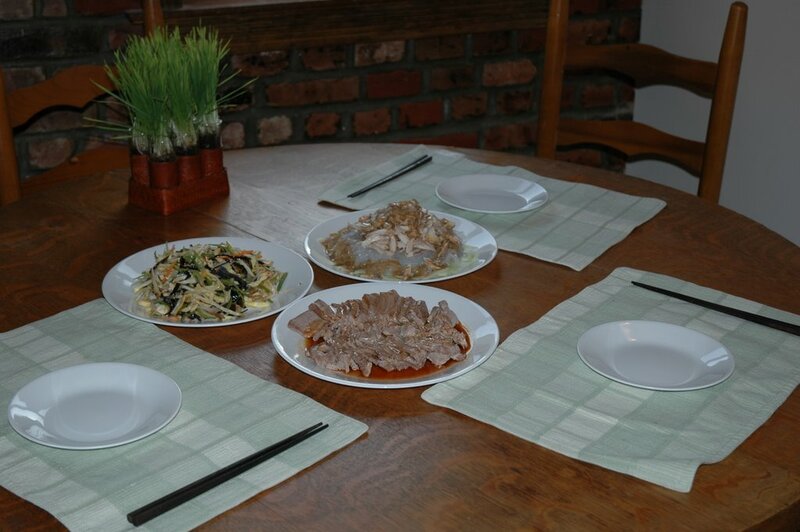 Though the food temperature was cool, the flavors were usually heavy, sometimes very spicy. I was told that Southeast Asian dishes used a lot of chili peppers because their spiciness stimulates one’s appetite, which usually wanes in the deadly heat. That might have some truth to it. But my hypothesis is that colder foods’ flavor and fragrance are less detectable (Try tasting ice cream, frozen and melted, and you’ll see the sweetness and flavor increase with temperature) and they require more heavy seasoning. As fate would have it, Yvonne and I picked one of the hottest days to scout the Brooklyn Chinatown. What a wonderful idea – Chinatown’s signature smell was amplified by the stifling heat, and we felt like we could have gotten skin cancer after 5 minutes in the sun. In any case, the trip was fruitful (literally because Yvonne bought lots of lychees), and I bought all the ingredients for my little summer night supper. 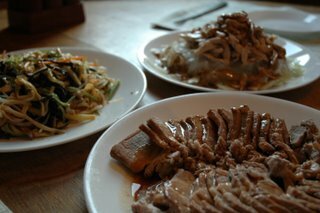 I made shredded chicken with wide mung bean noodles in sesame dressing (雞絲拉皮), poached pork with garlic sauce (蒜泥白肉), and 9-veggie delight (素什錦). The last dish really should require 10 different ingredients, but I chose to cook with only 9. All dishes were served at room temperature with white rice. We wrapped up the night analyzing Project Runway reruns and praising the AC over bowls of macerated cling peaches with iced chamomile milk. 1. Heat 1 Tbsp oil in a pan. Stir fry mushrooms until fragrant. Add ingredients that will take a while to cook like carrots, celery, bamboo shoots, wood ears. Season with salt and sugar. Take everything out onto a plate. 2. Heat the other Tbsp oil in a pan, stir fry the other ingredients and season well with salt and sugar. Add cooked vegetables from 1 and combine. Heat through, and add the mushroom soaking liquid if it gets too dry. Taste and adjust seasoning. Serve hot or at room temperature. Note: The ingredients in this dish are not set in stone. Add, substract, or substitute as you wish. Just remember to use many kinds of vegetables and keep the seasoning simple -- no soy sauce or other heavy seasoning. Try to enjoy the natural taste of each ingredient. This dish is frequently made for true vegetarians in Taiwan, who likely are Buddhists. In that case, scallions, onions, and garlic are considered non-vegetarian and should be avoided. Ginger, however, is allowed, and is often counted as a tenth delight. 1. In a large pot combine ginger, scallions, and rice wine. Add enough water so that the pork can be almost covered if placed in the pot. 2. Bring the liquid to a boil without the pork. Add the pork after it's come to a boil and cover. Bring it down to a simmer and cook for 45 minutes. Test pork doneness by poking it with a paring knife -- if no red liquid comes out it is done. 3. Drain, and leave pork in cold water to cool. 4. Combine the rest of the ingredients. 5. 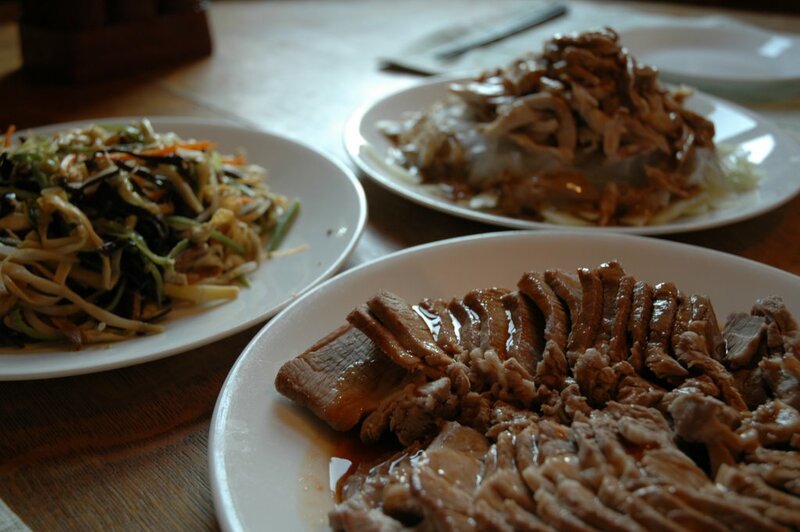 Cut pork into thin slices. Drizzle sauce all over. Serve. 1. Bring a pot of water to a boil. Place chicken in the water. Cover and simmer for 30 minutes. Drain and cool in cold water. 2. Peel and seed cucumber. Cut it into julienne and spread on a plate. 3. If using the wide mung bean noodles (涼粉), toss them with a little sesame oil and place them on the cucumber julienne. If using dry wide mung brean threads, soak them in warm water for at least 20 minutes. Drain and boil them for a minute or two until cooked. Drain and cool with cold water. Cut into short segments and spread on top of the cucumber julienne. 4. Shred chicken (discard skin), and place on top of the noodle/bean thread. 5. Mix 1 Tbsp chicken stock with wasabi powder (or just use 1 Tbsp of wasabi paste). Add the rest of the ingredients. Add more stock to desired consistency. Season with salt to taste. Drizzle over the plate. Present it as is on the table. 6. Toss and mix well at the table. haha, i didn't know that those things are translated literally to "wood ears." i thought you made the name up, so i googled around, and found that they really are called "wood ears." hilarious. your dishes look awesome as usual. perfect light meal for the summer. Yeah I was pretty surprised too when I learned its English name. Remember Wegman's Supermarket back in Ithaca? They used to sell fresh wood ears there if I remember correctly. I was very excited to see it until I saw the price. I used to buy their fresh shiitake mushrooms -- I would pinch off the stems before I bag them, haha! Considering the prices, I never felt guilty of doing it.